Polling for the first phase of seven phases of Lok Sabha Elections 2019 is taking place today. The state of Sikkim, like Lakshadweep, has a sole representation in the Lok Sabha. The voting in the only constituency of Sikkim began at 7 am on April 11, Thursday, i.e., on Thursday. 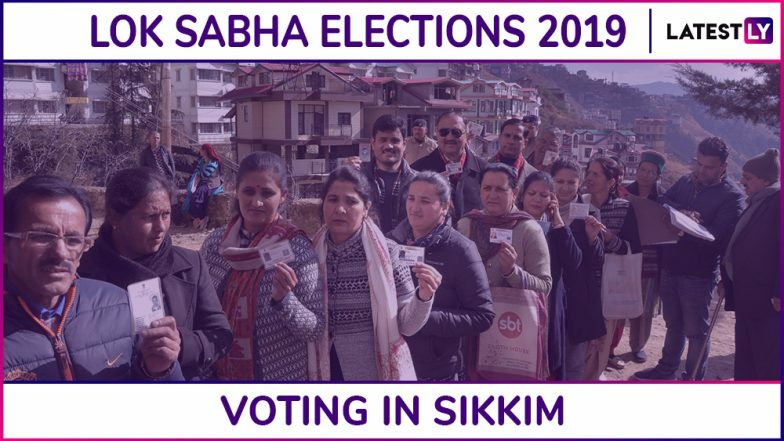 Voting is also taking place for Sikkim Assembly Elections 2019 across the 32 Vidhan Sabha seats in the northeastern state of India. Sikkim witnessed a voter turnout of 69 per cent till 6 pm. Sikkim Lok Sabha Elections 2019 Dates: Constituency-Wise Complete Schedule Of Voting And Results For General Elections. The first General Elections in the state were held in 1977, after it was integrated with the Union of India in 1975. In the 12 times that Sikkim has voted during General Elections in India, the Sikkim Democratic Front (SDF) has won 6 consecutive times, since winning the first election in 1996. Sikkim Lok Sabha Constituency in Sikkim: Candidates, Current MP, Polling Date And Election Results 2019. In 2014 Lok Sabha Elections, it was Prem Das Rai of SDF who won the elections by nearly the double number of the votes (159,351), than the second-placed Congress’ candidate, who fetched 74,483 votes. In 2019 General Polls, there are four key candidates in who’ll contest the upcoming elections. It will be a four-way fight amongst Dekh Bahadur Katwal of SDF, Shiraj Kumar Rai of Sikkim Republican Party, Bharat Basnett of Indian National Congress (INC), and Laten Tshering Sherpa of the Bharatiya Janata Party (BJP). The Election Commission of India has announced that Electronic Voting Machines will be used in all polling stations pan-India. Also, the voters will be able to check their votes through Voter Verifiable Paper Audit Trail (VVPAT) – the decision which has reduced the suspicion of EVMs being hacked. Along with Sikkim, people in Andaman & Nicobar Islands, Andhra Pradesh, Arunachal Pradesh, Assam, Bihar Chhattisgarh, Jammu and Kashmir, Lakshadweep, Maharashtra, Manipur, Meghalaya, Mizoram, Nagaland, Odisha, Telangana, Tripura, Uttar Pradesh, Uttarakhand, and West Bengal will also be polling today. The ECI, a month earlier, had made an announcement that the Lok Sabha Elections 2019 will be held in seven phases. The voting in the first phase voting has begun today, i.e. April 11, while the last round of polls will take place on May 19. The results of the same will be announced on May 23. Stay tuned to LatestLY for all the latest updates about Lok Sabha Elections 2019.